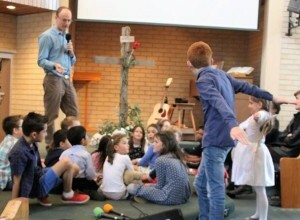 Brief: a children's story to complement a sermon on the parable of the ten virgins. I'm going to tell you a story about a very Rich man. Let's call him RITCH-ard. so popular there were 10 plane loads of people coming to his party. As all the planes approached the airport of the city where the party was being held there happened to be a large thunderstorm around the airport. So all the planes had to go into a holding pattern. Now, 5 of the planes had filled up their fuel tanks to full, even though their flights weren't very far. They happily flew around and around and around waiting for the storm to clear. The other 5 planes however only put in enough fuel to safely get to the airport and allow for a few circuits if there was fog or a little storm . BUT, after 40minutes of circling these 5 planes had to go to the next closest airport to refuel. So 5 of the planes headed out to land at the other airport to fill up.